Post your own holiday messages here to thank our men and women in uniform. Hundreds of thousands of military service members throughout the world will be separated from their families over the holidays. They need to know we appreciate the quiet sacrifices they and their families make on a daily basis, so that we might enjoy the holidays in peace with our own families. So, whether your holiday greetings are Happy Thanksgiving, Happy Hanukkah, Merry Christmas, Happy New Year, Happy Ground Hog Day, Happy Martin Luther King Day, Happy St. Patrick's Day . . . well, you get the idea. Whichever holidays they celebrate, we wish our soldiers, sailors, airmen, Marines, and Coasties a blessed day, and a safe journey home to their loved ones. We expect the majority of "holiday cards" posted here will be "Christmas cards." We want to make it clear we are not attempting to take Christ out of Christmas, as one reader thought when he saw our request for "holiday messages." Rather, we are simply leaving this page available year-round, so that you may wish our troops a happy holiday, whatever time of year it might be. And since the practice of sending mail to "Any Soldier" had to be stopped, we thought it appropriate to create a place where you can post your holiday greetings for the troops. So feel free to use this opportunity to send your personal Christmas cards for the troops! Or holiday cards for any other holiday. Click here to post your Thanksgiving messages. Have a Holiday Message for our Troops? Please express your thanks to those who are far from home, making it possible for us to enjoy a peaceful holiday with our own families. You may also share holiday stories, poems, etc. Read Holiday Messages posted by other readers. Entering your story is easy to do. Just type!... Don't worry about making it "sound pretty." Write what you would say if you were talking to a friend. Do you have a picture or graphic to add? Maybe a picture of yourself or your loved one in the military? Or a picture or graphic to illustrate your story or poem? Great! Click the button and find it on your computer. Then select it. 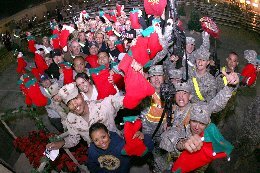 Lorie writes: Happy Holidays to our troops! We hope that you have a safe Holiday and return to your families soon. Return to top of Holiday Messages for the Troops.